Last night's "State of Hip Hop" preview panel sponsored by the Current was a lot of fun. Hip hop panels are always messy, especially when it's a packed house (as it was last night), but while there are bound to be tangents and nonsense, I think some really good stuff was said. 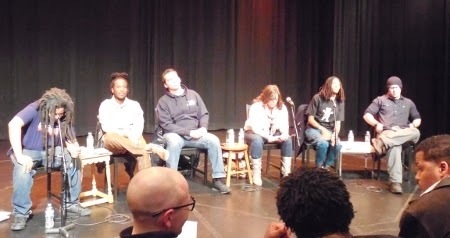 Thanks to Andrea Swensson, Kevin Beacham, the Lioness, Desdamona, Toki Wright and Slug, who were all on the panel with me, as well as everyone who spoke from the audience (including a number of bonafide legends, plus up-and-comers, plus youth, plus more) and continued the conversation after. We have one of the biggest, most diverse, most talented hip hop scenes in the country, but there are a small amount of music writers in town and maybe one or two are hip hop-focused. The rest might cover the scene, but it tends to be a fairly shallow look at a small sliver of the scene. That leads to a kind of gatekeeper effect based largely on association: the acts that get the most quality coverage are very often associated with another famous act or a fashionable behind-the-scenes presence. In short, it's cliquey. That also leads to tokenism-- if media swoons over a particular Black male artist (or female artist), it allows them to not have to think about the other 50 out here making good music. Music journalists can always "do better" (and I think most are genuinely interested in that) but real progress has to be bigger than individuals "doing better." It's about representation; it's about the culture and especially the hiring practices at media institutions. And as much as we don't want to let local media off the hook, another common theme was artists building our own media, sharing resources, signal-boosting each other and understanding that getting local press or getting played on the radio isn't as powerful as we often make it out to be. As I mentioned, if we really want to fix these problems, it's about seeking out, hiring, and paying writers of color, writers who are hip hop heads, writers from underrepresented neighborhoods, and ideally intersections of those identities. Reed Fischer from the City Pages told me that if I knew of any writers to send them his way. So if you're interested, get at me or him. Writers who are already in position to cover hip hop can always do more outreach, expand the scope of their personal hip hop definitions, and strive to make the amount of hip hop coverage match the amount of hip hop here. Jack Spencer at City Pages is doing a great job. Rob Callahan from Vita.MN told me that he'd like to do more if we reach out to him. One really simple thing could be more regular hip hop features-- there will always be album reviews and concert announcements when they come up, but stuff like Jack Spencer's local mixtape roundups, or producer showcase playlists, or any recurring feature with a hook like that can be an easy way to institutionalize hip hop coverage. Make the planning meetings open to the public. Barring that, posting the meeting notes publicly so that the planning is transparent. Be super-wildly-mad-stupid intentional about the lineup. Let's get the other elements represented. Let's get the pioneers represented. Let's get the Northside represented. Etc. Work to secure a whole bunch of comp tickets that those of us who work with youth, particularly youth of color from underrepresented neighborhoods, can get those tickets out to anyone who might be interested. Make sure that this big event isn't the end of the relationship. As Tish Jones mentioned last night, let's get more hip hop acts on the Fitz stage (if the acts want to). If the Current really reps local music, let's get more than one hip hop show per week. Let's get a wider diversity of artists into the playlist. Even when the game is BS, it can help to know the game. For anyone out there who doesn't know how to write a press release, or who to send it to, or how to effectively manage your presence on social media, and all the other practical things that go along with succeeding as an artist, I'm interested in sharing that knowledge. You can get in touch with me, but this is also about collaborating more in a general sense. When we crew up, when we pool resources, we all do better. Finally, we can build our own media, leveraging social media power while creating new outlets. Even more than that, we can understand that "media" isn't just newspapers and radio stations; it's how we transmit any ideas-- so word-of-mouth, flyers, however we promote. As Toki said last night, going directly to your people to spread the word about your work is going to be more effective than any write-up or radio play. Why isn't there a blog dedicated to MN hip hop? I mean, I'm sure there are a bunch out there somewhere, but I mean one that is intentional and well-trafficked and curated by people with an authentic relationship to the culture? I could see one with 3-4 posts per day (maybe a couple local features-- new songs, reviews, concert previews, etc., and one"from the vault" feature of an older song); with the right people involved, that could be really powerful. I know: "so why don't you do it Guante?" I think a project like this would have to be a crew of people's main project. I'd love to contribute, but to do this right would mean to do it with laser focus. Toki mentioned getting a room at McNally Smith once or twice per month to continue these kinds of conversations, plan for the future, and organize together. So look out for that. Toki also mentioned bringing back the TC Hip Hop Awards, and someone else mentioned bringing back the TC Celebration of Hip Hop. Personally, I'm all for big events, but I also think big events can be a time/energy/money drain. I'd rather see big events arise organically from new organizations, which relates to the previous point. Still, something to consider for anyone interested. Me and Big Cats, and me by myself, have run workshops on introducing media skills to any artists who want them-- so again, press releases, using social media effectively, getting your work reviewed, etc. Feel free to be in touch if you run a youth program or have access to a community space where that could be useful. To wrap up, I keep thinking about the difference between a "scene" and a "community." We have both here, but I'd say that right now, the scene gets all the attention, and we could do a lot more to build the community. And part of that is the same old "hip hop is beautiful and brings people together" stuff, and part of it is practical too-- a more supportive, intentional, deeply-rooted community with respect for the elders, the youth, all the elements, etc., is a breeding ground for success. Media can't be the driving force for that, but it can play a role. What else? This is just my take-away from last night, but it's absolutely not everything that needs to be said. Feel free to leave a comment. A million things happening at once, as usual. New music coming, a ton of April shows all over the country (see the calendar on the right), various projects in-progress. 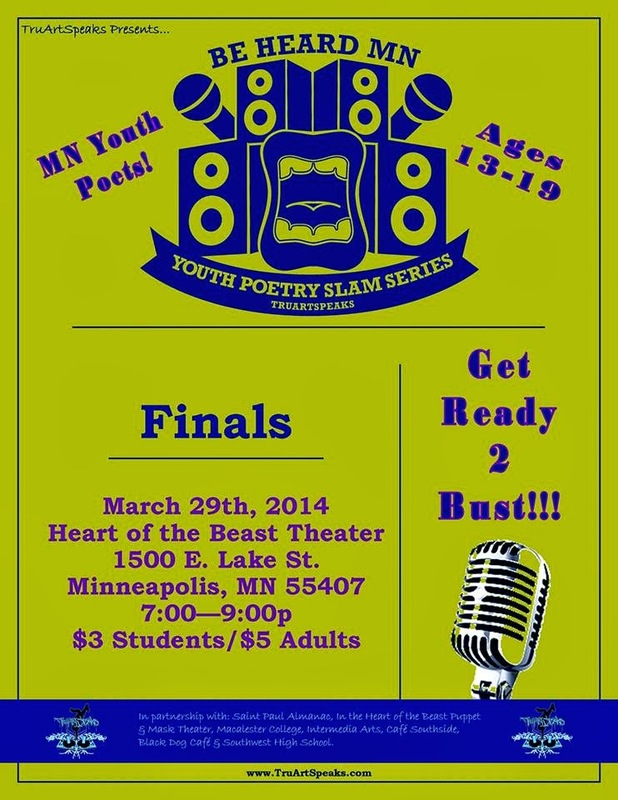 One highlight of everything, though, is the Be Heard MN Youth Poetry Slam Series, organized by TruArtSpeaks. We've already seen dozens of wildly talented young people sharing their work in the prelims and semis, and now the top ten will compete for a chance to represent MN at Brave New Voices 2014. I have the honor of hosting the big Finals slam, and DJ Stage One and BdotCroc will also be performing. Here's the Facebook event page. As always, it's not really about the competition; it's about the community. Regardless of who gets on the team, TruArtSpeaks will continue to organize open mics and provide other opportunities for young writers and performers to share their work and build with one another. And this show should really be something special. I'm hoping we can have a full house to support these young voices. See you there.